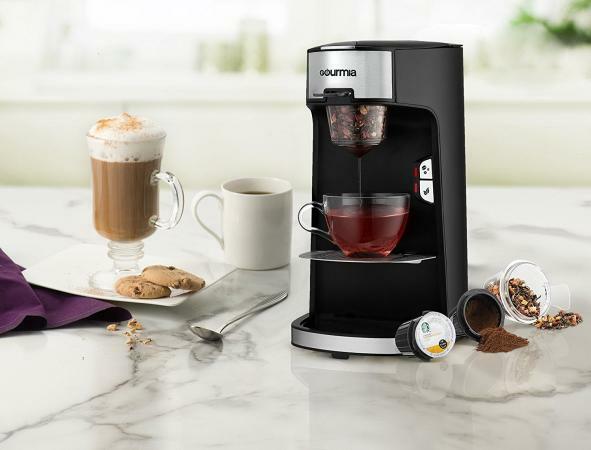 If you're looking for a versatile single-serve hot beverage maker, you just might find that the Gourmia GCM3600 Single Serve Coffee & Tea Maker is the right option for you. The Gourmia team sent me one of these innovative all-in-one machines to try for myself and I found it to be an easy-to-use solution for making individual servings of several varieties of coffee and tea. Available from Amazon for just under $40, Gourmia's GCM3600 Single Serve Coffee & Tea Maker is a more affordable alternative to some other single-serve coffee and tea brewers that are on the market. It is also very versatile. It includes accessories that you can use to brew ground coffee (which is the primary way I use it), as well as to brew coffee or tea from the popular K-cup containers or to make hot tea from loose leaves. This small appliance is set up and use, and it is also fairly compact. With measurements of just 8.6" X 10.1" X 14.5", it doesn't take up a lot of counter space. No assembly is required - just plug it in and you'll be ready to brew. Before you use this brewer for the first time, you'll need to spend some time reviewing the documentation to make sure that you clearly understand which accessory to use for the type of brewing you're going to do. For example, if you use the K-cup accessory with regular ground coffee, you'll end up with a mess to clean up and a cup full of coffee grounds. We won't talk about how I know that (it was ugly!). Just trust me when I say you need to make sure you're using the correct accessory! Once you have selected the correct accessory, just pour up to 14 ounces of water in the reservoir, put your cup or mug in place, add your coffee or tea (to the proper accessory!) and push the (correct) button to start. You'll have a fresh cup of your favorite view in virtually no time at all. Note: I say 'correct button' because there are different buttons for coffee and tea. The difference is obvious as the coffee button has pictures of coffee beans on it and the tea button has images of tea leaves. If you're looking for an adaptable (and affordable!) single serve coffee and tea brewer, this is definitely one worth checking out. It's great for individuals who like their hot beverages brewed one at a time for maximum freshness, as well as for households where family members or roommates have widely varying preferences in coffee and tea. Gourmia is known for innovative small appliances, and this one definitely doesn't disappoint! Note: The author received a unit to review at no cost. This in no way influenced the content of this article. The opinions presented here are her own.